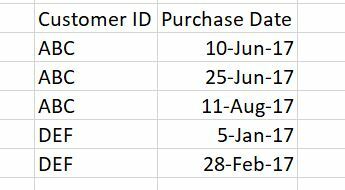 I have a table with customer id and month of purchase. For each customer, I first need to segment them on their first month of purchase, i.e., if a customer did their first purchase on 10 June 2017, then they belong to bucket June 2017. See below sample data table. Then for each subsequent purchase of that customer (say from June 2017 segment), we need to track the month. For instance, if the June 2017 customer did their second purchase on 25 June 2017 and 3rd purchase on 11 Aug 2017. Then second purchase will be counted in 1st Month (within 30 days of 1st transaction) and 3rd purchase will be counted in 3rd month, as difference between 11 Aug 2017 and 10 June 2017 is 62 days, which lies between 61 and 90 days, hence in the 3rd month. See below sample output table, although I need it in percentage form (% of customer who did in first month, second month, etc.). In the table, we are showing all the customers who did their first transaction say in Jan 2017 and then how many of them did transactions in subsequent months. This tracking needs to be done for each customer. While I believe I am comfortable with the first part, wherein I need to segment each customer, I can do that based on first or partition. I am not sure about how to do this recursively for subsequent transactions. You simply use window functions to define the original month and then conditional aggregation. I invented the months_between() and to_char() functions, but you should get the idea. You can use the lag function to create a column “previous purchase. Then simply do a datediff and bucket as you wish. Not the answer you're looking for? Browse other questions tagged sql recursive-query or ask your own question.